I want to be a part of the vision and implementation involved in growing Grande Prairie as the amazing community that we know and love. I have been a resident of Grande Prairie for almost 40 years and I am fortunate to have the majority of our family and a network of amazing friends here so for me this is home – a home that I am very passionate about! Over the past 20 years I have been self-employed as a local business owner, building my companies on a network of relationships that strive through teamwork. Through such teamwork we have been able to celebrate achievements such as the Corporate Volunteer Award, local New Homebuyers Customer Choice awards, local Builder of the Year awards as well as the Alberta New Homebuyers Customer Choice award. These achievements are due to our strong dedication to teamwork, relationship connections and community. I have been on many boards and committees for over 10 years now and from this have gained the experience and working knowledge of a variety of Strategic Plans, the Municipal Government Act, the Municipal Development Plan, Land Use Bylaw amendments and additions since 2009, as well as a variety of Long Term Planning processes. All of the above experience, commitment and passion has influenced and prepared me in my decision to run for City Council. City’s Design and Construction Manuals. Alberta Government on changes to the Municipal Government Act – MGA. These items give me a very good understanding of how our City develops, regulates the developments and how construction is to be completed. From being part of this I can speak first hand of why I feel we have lost the Estate Home Market as well as lost market share for Industrial development. These 2 areas have lost our City much needed revenue and I believe it’s time we get honest about addressing them so we don’t continue to loss more market share to County and MD. I have been actively passionate about taking part in various nonprofit community boards and committees throughout my life and have been proud to be a part of such an inclusive, generous community. My concern is that over the years I have watched our taxes increase and currently residents don’t feel as though they are getting value for what they are paying. My belief is that as our city has grown, the aspects of financial responsibility, financial transparency and economic revenue growth has slipped. Over the next four year term, if we do not begin to regain stability in these areas our nonprofit and community sector will suffer because our community will not be able to afford such rounded support to these areas. I have owned my own business for over 20 years and particularly in construction for 13 years. I am very experienced in the governing aspects that result in financial responsibility such as large business budgeting, strategic planning, the Municipal Development Plan, city wide design standards, along with many more. These skills and experience are what have resulted in mine and my team’s success in the construction world. I believe that it is incredibly necessary to focus on ensuring our City’s budget is balanced to in turn have our community grow. I believe we need to focus on reducing expenses and increasing how we will attract economic development to our City. I would like to see our City be in the financial position to put money back into community safety be known as one of the safest Cities to live in Canada. I believe that a specific allocation of funds is not a fair comment for me to make without a more detailed, focused and researched look at the specific line items of the current budget. I do believe that increased funding to community safety along with an increase in communication and transparency with Grande Prairie residents is important in ensuring our community remains connected. With a hard look at the budget and our future strategic plan I believe that we can make some tough decisions that will be in the betterment of the residents of Grande Prairie. The City has a lot of very good employees and I believe that if we can increase the morale within some City departments we will continue to attract a positive and efficient culture in the future. Grande Prairie has many successful outcomes and events that deserve to be celebrated. By visually celebrating these events in public areas, such as the Community Connections guide, Eastlink Center, library, airport, etc. the residents of Grande Prairie would be able to see all the positive aspects that our City has been a part of. This would also allow our City employees to feel more accountable and celebrated in the part that they had in particular outcomes. Capital Projects – In 2017 the City’s budget for Capital projects was $30,000,000 and having vast experience in project management, construction and development I am very confident we could save up to 10% if we reviewed our processes and ensured we were doing the right capital projects. So after these items, which I feel can be addressed the quickest, we can discuss areas of efficiencies within some of our City’s departments which I feel over a 4 year term could also result in much more savings. On the revenue side it will takes years to get back the industrial market and estate home market but if we don’t start working on changing this now we are just further prolonging the timeline of when we will start seeing these projects come back within the City limits. We also need to start doing a better job with how we sell and market our real estate. Part of the “Strengthen our Core” strategic plan from last Council was to try and get more development downtown to add revenue on lots that are sitting vacant. Sadly the City sold/gave away two lots in the former Germaine Park and York Hotel sight. I feel that if this were handled differently it would have resulted in much, much more revenue for the City. If you were trying to sell a piece of Real Estate would you put a for sale sign on it? Would you contact the Developers, Builders and Investors that may have an appetite for your project to try and sell it? Sadly these steps weren’t taken and I would like to be much more involved with how our City manages its Real Estate. I would like to work closely with our Economic Development staff on these areas to help ensure that the City has a better presence in our City’s future economic development. The stabilization of our taxes depends on making difficult choices and digging deep into ways that will give value back to Grande Prairie residents. Ideally crime needs to be addressed on a municipal, provincial and federal level. At a local level we need to focus on education and spending resources in the most effective areas. This can be done through increased Bylaw enforcement in various areas of the City, community neighborhood initiatives, as well as ensuring available support systems for people in need. These of course are only a few suggestions, I believe by encouraging suggestions from the community productive solutions can be found. As City Councillors we must listen to our community and respect that their suggestions need to be incorporated into solving an issue as big as crime and community safety. Grande Prairie has a very involved community presence and I believe by meeting with neighborhood associations on a regular basis we will be able to get a more accurate, rounded view as to what solutions could result in long term success. I believe that it is important to have a balanced perspective when making decisions based on the best interests of others. I truly believe that I can offer a balanced perspective due to my history in Grande Prairie for over 40 years, my level of community involvement, my success and growth in the business sector and the fact that I am raising a young family which will only widen my perspective and experience within this community over the years. 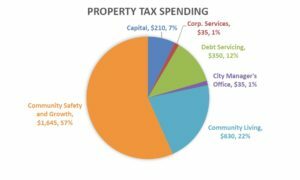 In order to ensure that our community continues to thrive and be connected in a positive way, as a City we must make sure that we promote financially responsibility, increase our level of communication and transparency, and gain a focused approach to economic revenue growth to ensure taxes do not continually increase. Without such an approach our community programs will begin to suffer due to lack of funding and decreased affordability for residents to be involved in fundraising events.